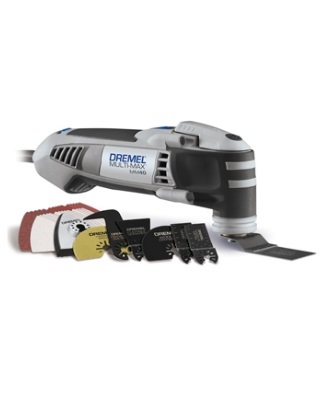 The Dremel Multi-Max MM40 gives you features and performance you’d expect from the Dremel brand. To start, a robust and powerful 3.0 Amp motor is capable of tackling the toughest applications. It has Quick-Boost electronic feedback that maintains constant speed through the toughest materials. The tool’s patented Quick Lock accessory change system makes switching between the broad range of Multi-Max accessories quick and easy. The tool also has the Quick Hold magnetic flange that holds your accessory in place for easier accessory changes. With the right accessory in place, you can launch right into the task at hand knowing that the MM40 can comfortably handle whatever Oscillating Tool task you throw at it.